About the author: Paul Santisi has quickly become one the most listened to authors in the World within several years in the areas of meditation, self empowerment and spiritual awakening. With a growing audience in the countless millions of people in every country in the World, Paul Santisi audios are some of the most effective, eye opening, soul expanding recordings ever published! 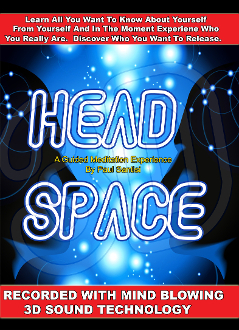 HEADSPACE #2 in 3d Sound! This meditation is POWERFUL!. It's a unique approach to attain inner information about anything you want to know and learn about from yourself. That’s right from yourself. There is alternate versions of ourselves who have already accomplished everything that we currently seek and desire. There is an unlimited number versions of yourself that have all the answers to every question that you want to know about yourself. This 3d sound technology puts you in the room along side with Paul Santisi. You will feel as if he is only talking to you, because he is. The way the sound is captured is so life like that your mind will create the environment around you. Also you will hear Paul Santisi from everywhere all at once. Paul Santisi has pioneered the 3D meditation industry and nobody has even come close to figuring out how he does it. Simply addicting positivity for the mind and soul. Listen with headphones on to experience this magical 3D Sound all combined with simply breath taking music.